Powafix Gypsum Skimming Plaster is a versatile interior finishing plaster for ceiling, dry walls and cornices. Our unique white drying formulation is easy to use fast drying and cost effective. Can be painted to smooth finish. 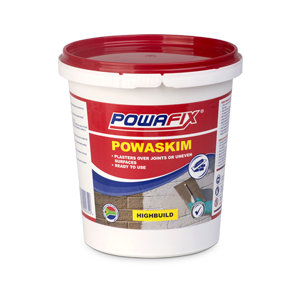 Mixing ratio: ±2 parts Gypsum Skimming Plaster to1 part clean water. 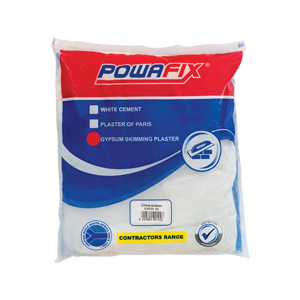 Add Gypsum Skimming Plaster slowly to clean water. Leave mixture to soak for approximately 15 minutes. Mix thoroughly with a paddle until a lump free consistency is obtained. Apply 3 – 4 mm thick layers. Allow 10 – 12 hours drying time before painting. Prime dry plaster with Powafix Plaster Primer before painting.